​ to our newly added 2018 schools! We look forward to bringing gardening to your students! ​ will consider applying again in the future. We wish you all the best as you look to build your school gardens. Please feel free to use our online resources as you develop your programs. 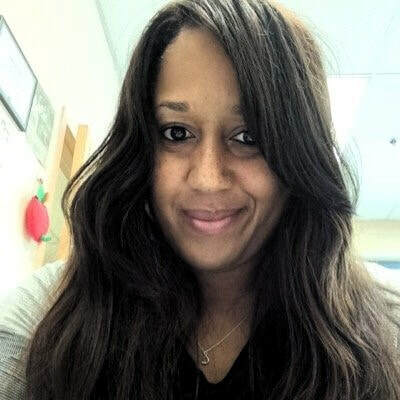 Sonya L. Harris, special education teacher at Dorothy L. Bullock Elementary School in Glassboro, NJ is the New Jersey Agricultural Society's 2018 Teacher of the Year. Four years ago, Sonya Harris decided that the 500 students at Dorothy L. Bullock Elementary School in Glassboro needed a garden to show them how plants grow and to encourage them to eat fresh, healthy food. She wanted the garden to be a space where teachers could use gardening to teach reading, writing, social studies, and science. Sonya gathered a group of teachers together to plan the garden. Her vision for the Bullock School Garden was big, so she did not start small. She contacted Los Angeles celebrity landscaper Ahmed Hassan of the TV show “Yard Crashers” to ask for guidance. He advised the Bullock Garden Team on what was needed to establish a sustainable school garden and put them in touch with local South Jersey landscape designer, Mike Pasquarello of Elite Landscaping. Together, after almost a year of planning, and with community fundraising and donations from 24 local and national businesses, the Bullock Children's Garden was built on the weekend of May 2, 2015. At the same time, Sonya and her team at Dorothy L. Bullock Elementary School were the first ever to receive a school garden training grant from the New Jersey Agricultural Society’s Learning Through Gardening program. This grant gave teachers curriculum and training to enable them to use the garden as an outdoor classroom where they can teach every subject. ​When the garden was unveiled, Bullock School also opened its STEAM Classroom, home of the indoor garden and ‘growlab,’ where lessons in weather, engineering, robotics, mosaics, and horticulture are taught, and where Sonya’s newest venture – an after-school garden club – is based. Through gardening indoors and outdoors, Sonya is teaching at-risk children in this club the joys and benefits of eating fresh, organic foods, and how to grow them at home. Sonya’s enthusiasm for the Bullock School Garden has been contagious. All of the school’s teachers now use the garden, and eight teachers are piloting literature-based, cross-curricular lessons developed by the garden team in partnership with Rowan University. In October 2016, Sonya was awarded the first “Best in New Jersey” Jersey Fresh Farm-to-School Award by the New Jersey Department of Agriculture for her drive to ensure that the Bullock Children’s Garden serves as an outdoor classroom to teach children lessons across the curriculum, and provides free, fresh, organic produce to the local low-income community. Next, Sonya began to spread her school garden message beyond the walls of Bullock School. She is leading the expansion of the garden education initiative to all the schools in the Glassboro School District and serves as a mentor for several New Jersey schools to assist them in creating school gardens. Most recently, Sonya has established The Bullock Garden Project, Inc., a non-profit organization designed to to assist schools serving large populations of at-risk, low-income students in creating garden-teaching programs. ​Born and raised in Paulsboro, New Jersey, Sonya received her BSEd in Special Education at West Chester University in Pennsylvania and is currently pursuing her MAEd in Teacher Leadership at Rider University, in Lawrenceville, New Jersey. She has 20 years of teaching experience and has been teaching at Bullock School for the past 12 years. “When we plant these seeds in the lives of our children, the harvest society will reap is filled with endless possibilities!” said Sonya. For the passion she brings to school gardening and her efforts to spread this passion throughout the state, the New Jersey Agricultural Society is proud to name Sonya Harris its 2018 Teacher of the Year.